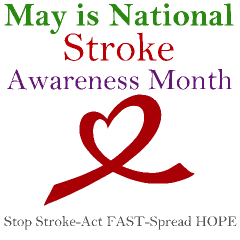 May is National Stroke Awareness Month, held every year to increase public awareness of stroke and how to help victims of a stroke. Stroke is the number 3 leading cause of death, and the leading cause of adult disability in the U.S. Additionally, 4 out of 5 of American families are affected by stroke. If your parent has had a stroke, then you are not alone, even though it may feel like it at times. 1. National Stroke Association: Find information, resources, and support if you are caring for a stroke survivor. 2. Stroke Awareness for Everyone (SAFE): A handbook to help new caregivers to stroke survivors, written by a task force of experienced caregivers. 3. American Stroke Association: Read articles with information to help you care for a stroke survivor and yourself. 4. Resources and Education for Stroke Caregivers’ Understanding and Empowerment (RESCUE): Provides stroke caregivers a “rescue” line for caring for their loved ones. 5. Caring Web: Caregivers can find educational information and support. If you are in the Danville, Virginia area and need home health services as part the post-stroke recovery journey for yourself or a loved one, do not hesitate to contact us at 434.836.5883.